When I was around 12 or 13, my family and I took a trip to the Bahamas. Now, I have little recollection of this trip (as with most of my life before age 16…we still don’t know why), but I do remember one very special day. The Bahamas are not terribly when you’re a kid. You don’t really care much about relaxing on the beach, and your friends aren’t there. Your mom won’t let you just chill in the hotel room and watch Boy Meets World like you want. What is fun when you’re a kid is a boat shaped like a banana. It’s still pretty awesome, if you think about it, but when you’re a kid, it’s the best, especially when the boat drags you and 15 other idiots through the Caribbean waters at lightning speed. As you can imagine, my mother wasted no time throwing me on the fruit-shaped death ride. We had just seen the the paramedics come to treat an older woman whom we guessed had a heart attack while on the banana boat, but this didn’t stop any of our parents from letting us hop on. My younger cousin, Corey, was most excited. A rambunctious child, he thought the banana boat would be more fun than anything he’d ever experienced. My Aunt Pat strapped on a life jacket to join us for the ride. Before we could get fully situated on the raft, Corey had a change of heart. 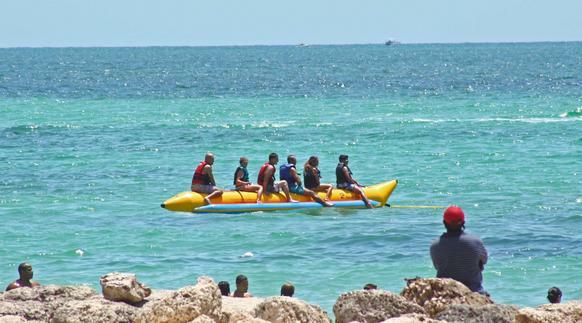 The boat was shaped like two parallel bananas (obvi), and I was on the banana beside Corey. He said something along the lines of, “I don’t want to do this!” just as the engine began to roar. “Nooooooooo!” He screamed as the banana boat took off, full speed, into the deep, wide ocean. Corey cried that day. He cried for the entire banana boat ride. While Aunt Pat, the other passengers and I shouted things like “Wahoo!” and “Yippee!” Corey sat beside us wailing like a newborn. He held on tight, and the faster we went the louder he screamed. At a certain point, in the middle of the ocean, I turned to see Corey quaking with fear. He was about 11 (who let an 11 year old get on the banana boat? ), and had quite a “tough guy” mentality. But now here he was, like wimpering like a baby lamb. “Hahahahhahaha!” I laughed, just as we picked up speed again. The screaming recommenced. We returned to shore safely, Corey running to the crowd of adults that awaited us. They all wrapped their arms around him as he retold the tale of the banana boat. They felt very badly about having put him on. It was clear that he would not be partaking in any water excursions for a very long time. Corey (who prefers his given name now, but I will persist with Corey) has grown up to be a big guy. He’s pretty tough, and he’s pretty cool. There is not a lot that he is afraid of. But (and I hope you are reading this, Corey) any time he gets to big for his britches, I think he should remember the time that he cried like a baby while riding on a raft shaped like a piece of fruit. Gym memberships are expensive, and so some people in New York City have opted for a less traditional workout plan. Today, as I rode the 3 train, a homely girl sat quietly next to me. She was reading a book whose title I couldn’t see, but my best guess is something like “Anne of Green Gables.” Her hair was a thin and flat, her skin pasty. She wore a t-shirt and khaki shorts, and glasses rested atop her nose. She seemed to be a nerd, but nothing too out of the ordinary. Just as I was beginning to focus on my own book, the train pulled into the Chambers Street station. MORPH. The girl transformed into an athletic beast once again, trading her book for the bar. 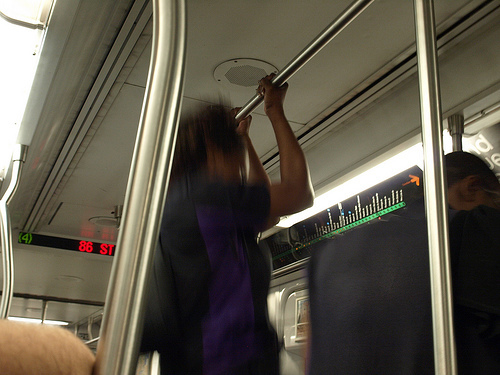 A new crop of straphangers watched as she beefed up her biceps. A few people stepped on and promptly decided to head onto the next car, for nothing good could come of this freak show. Finally, I reached my stop, and as I stood up to get off, the nerd pounced back on the bar for more. I was perplexed and impressed. I can’t do even one measly pull-up. But had I the ability, I probably wouldn’t do them on the train. Or maybe I would. Yeah, probably on the first day I conquered the pull-up I would do them all day, everywhere. I would do them and wait for someone to say “My, how strong you are!” and I would smile coquettishly. And maybe that was what this girl was doing. Just waiting for one of us to praise her physical prowess. But let’s be real. It was weird. It made everyone uncomfortable, and I’m glad it wasn’t me. Train pull-ups are an interesting phenomenon. Just last week, as I rode to work in the morning, a man sprinted onto the train and began doing rapid fire pull-ups. He then began to pace the train and talk to himself. I quickly diagnosed him as crazy. But this girl seemed fairly normal, if a little geeky. Maybe this is a hot new trend, train pull-ups. Maybe hipsters will start doing them on the L. I don’t know. So if you happen to spot a puller-upper anytime soon, I told you so. Pull-ups will be in US Weekly. Maybe People magazine will have a “Hot or Not” column, and on one side there will be pull-ups (hot) and on the other push-ups (not). In any case, this is a cost-effective way to stay fit, and I think the nerd and cray cray man are on to something. 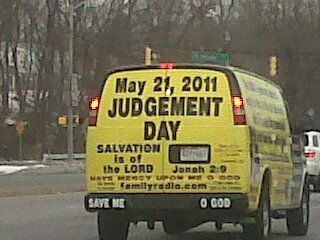 What Will You Wear on Judgement Day? The only safe place is inside of this van. Unless you're a child, in which case stay FAR AWAY from this van. Secondly, we all kind of saw this coming. The recent events around the world have been a little “end of the worldy,” and what with Arnold’s love child being revealed, it’s clear that eternal destruction is on the way. And finally, May 21 is so soon. Saturday! I didn’t consider this when I first saw the sign, and now it’s just around the corner. I always do this! I should have marked it in my calendar. Now, I must ask myself a very important question: what am I going to wear? I mean, it’s the last time people will see me. I want everyone’s last glimpse of me to really make an impact. I’m thinking something flirty, but no too wild, since it will be kind of a somber occasion. But it should also be something easy to run in, you know? I want to wear something indicative of who I am, and who I could have become (were it not for the end of the world). Thus, I have decided to sport a romper, and I think it’d be a good idea if everyone did the same. Think about it. It’s the apocolypse. The entire earth is quaking with sin and hatred. What would lighten the mood more than to look around and see the minions around you (men, women, and children) running around madly in one piece short sets? I’ll tell you what. Nothing. People are screaming, “Ahhhhhhhhh! Ahhhhhhh!” arms flailing, things are falling, the earth opening wide, and everyone is wearing rompers. EPIC. I’m pretty confident in my choice of attire for the big day, and I think you will be too, if you take my advice (although, let’s vary it a little. Don’t everyone wear a sleeveless floral romper. Let’s do some solids, some patterns, maybe some pant jumpsuits). The next issue on my agenda for the apocalypse is what items I should purchase in preparation. I think we all remember how valuable that duct tape and bottled water was in 2000, the first time the world was going to explode, and I think we need to be equally equipped this time around, with bunkers and whatnot. I went to Lot Less earlier today, and I think I am more than ready for Judgement Day. I have three weeks worth of wine coolers, a variety pack of snack chips, and a Craig David CD ready to go. If it’s ’bout to pop off, then let it pop off. I don’t know about you, but I’m getting pretty pumped for Judgement Day. I’ve already started listening to the CD, and I’m not even concerned about working out to look good in my romper. I mean, how much can I change in the next five days? Besides, we shouldn’t spend our last few days doing nonsensical things like pilates planks. We should do the things that are important to us, like eating, and watching Hulu while eating. In case this is my last blog post, I just want to thank all six of you for reading. I think you each know your fate, and it’s really too late to change that now, so pour yourself a double and hold on tight. Last week, Facebook rumors were swirling that there would be a guest writer for this week’s edition of The Lo Down. I’m not exaggerating when I say it was all anyone could talk about. Well, you may have noticed that there was no post on my blog at all this week (police had to stop violent protestors outside of my window on Friday morning. Many people were injured). This is due to the complete failure and lack of responsibility of the guest writer, who I am now ready to reveal. Last week’s failed guest star was going to be my latest celebrity boyfriend, Donald Glover. 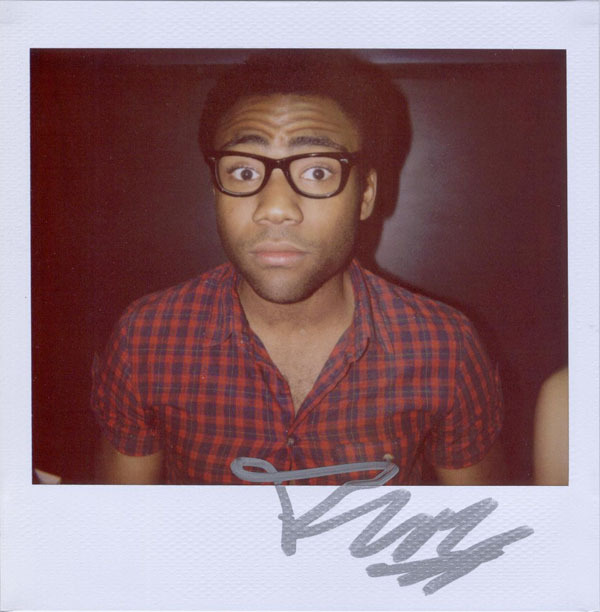 You may know him from Community, as a writer for 30 Rock, as rapper Childish Gambino, or from his College Humor video, in which his character poops his pants (a personal favorite). Though I’m very protective, I thought he might be qualified to write just one column for my very popular blog. Also, he is my boo, and so he gets special treatment. WTF, dog? You were supposed to write for my blog this week. I hyped you up, and you gave me nothing. I was gonna bake you cookies for when you got back to New York, but now I’m just going to eat them myself. You’re a bad boyfriend and a careless employee. First of all, my name’s Donald, not Danny. You’re not dating Danny Glover. You do know that, right? Second of all, I’m famous. You need to calm down, because I really don’t have time to write for your WordPress blog. I’m out here on the road with this show, and b*$&#es are all #&! with s#$&@! tuna. Last night I g#%$ a y#*$%@ with six t#&@ covered in honeycombs. The last thing I’m thinking about is your blog. Sorry, Boo Boo. And I don’t really care about the cookies, because depsite what your friends say, I can tell you use whole wheat flower, and it’s just really not as good. Needless to say, I was not pleased. Heavy eye-rolling commenced, and I had to do a lot of Googling to even gain any idea of what he was talking about. I replied to his email, and wrote on his Facebook wall, and Tweeted at him, and texted him. I did not call him, because we are still not in the stage where that sort of contact is comfortable. The only response I got was a twitpic of him and Mila Kunis both giving me the middle finger. I sent him a twitpic of me eating his cookies in a dashiki. There’s really no response to that, so it looks like I got the last Twitter laugh. But I really was fed up about the blog thing, so I am waiting outside of his apartment now (have been for 27 hours, and the rain just won’t stop) ready with an ultimatum. If he does not agree to write the blog within the next seven days I will a) start wearing a retainer ALL THE TIME, b) tell his mom that he never wears the capris she sent him and c) replace the Albuterol in his inhaler with Glade air freshener. Danny Glover would never put me through such hell. Next week I turn 24. That means nothing. 24 is an uneventful age, let’s be honest. But I think I should make something of it, so I have crafted a list of 24 things to do in my 24th year. All of these are real goals. Please respect them. 1. Learn to speak a new language. I will probably go with sign language. A couple of weeks ago, my friend’s roommate told me that baby’s learn signs before they can learn to speak. She is a babysitter and is teaching her baby (of sitting) sign language. I choose to learn from a baby. It just makes more sense that way. 2. Try a new hairdo. Some of you may remember the “bangs” situation of 2003 (more like a hair don’t! ), but other than that, I haven’t done anything new to my hair since I was about 12. I may start a new style that combines the afro and the bowl cut, or I might part my hair on the opposite side. It’s hard to say. 3. Gain 200 lbs. so that I can go on the Biggest Loser. (Spoiler alert: I won’t lose any of the weight…and I won’t even make it to the second round of auditions). 5. Find my “Best of Ginuwine” CD. 7. Earn enough money to upgrade my diet and become a strict carnivore. That’s right. Only meat. Animals in my tummy. 8. Finally meet my idol: Suzanne Somers. 9. Get a pedicure from a dog. Or just get a pedicure. 10. Use the sign language I learned from that one baby to establish an army of babies. I don’t know what I want them to do, but I’ve already ordered the uniforms. 11. Meditate for 30 minutes a day (this is the least likely to happen). 12. Learn to play the harp. I mean, how many people know how to play the harp? Six probably. I’ll take my harp down into the subway station, and I’ll play for hours with a hat in front of me. I’ll have earned about $5 (the harp only cost $500,000) when the churro lady will roll her cart by. I’ll reach down for a dollar, and as I do, someone will steal my harp. I’ll say, “What? How are you even able to run so swiftly with that?” But the thief will be gone, and I will stand eating my churro in despair. 13. Fix my closet door. 14. Learn all the words to a Florence + the Machine song (any one will do), so that when I sing it to myself in the mirror, I’ll be able to get into it a little more. 16. Come up with a curse word that will shock the world, because sometimes when I pour hot coffee on my pants, “Darn!” just doesn’t cut it. 17. Go to a Beyonce concert, sneak backstage, and come onstage as Beyonce. 18. Ghost-write Shannen Doherty’s autobiography. 19. File a restraining order against the babies. They will turn on me. 20. Get good at Ken Ken. 21. Buy a pair of jeggings, because hey, why not? 22. Have a secret meeting with Betty White to find out how she has lasted so long. I will formulate a serum from her tears (she will absolutely cry during this meeting), so that I can hit my peak success when I’m too old to care. 23. Start a standup comedy routine that will be deemed “provocative and…edgy” by critics. I’ll be a huge hit, until people realize it’s the exact same act as Andrew Dice Clay circa ’99. 24. Commission an artist to create a 6×6 ft mosaic of myself above the couch in my apartment. So, even though 24 is an anti-climactic age, I am going to make sure it won’t be. What with baby militia and Ginuwine CD, 24 just might be my best year yet.